Design a condom to empower women and see Alicia Keys and Kings of Leon for free — find out how! Activism doesn’t always pay the bills, so here’s some good news for global changemakers: You can see Stevie Wonder, Kings of Leon, Alicia Keys and John Mayer for free in exchange for taking action around pressing international issues. For the second time, The Global Poverty Project will host the Global Citizen Festival, a free ticketed concert on the Great Lawn of New York’s Central Park. Between now and the September 28 show, fans can earn tickets at Global Festival.com by taking online actions like watching videos, signing petitions, and sending emails to world leaders. All the actions center on the festival’s four themes: education, women’s equality, global health, and global partnerships. As with last year’s event, the date corresponds to the United Nations General Assembly in New York, where The Global Poverty Project aims to put pressure on participating world leaders to accelerate progress on these issues and help end extreme poverty by 2030. One of the first actions asks fans to sign A World At School Initiative‘s Stand With Malala Petition, which demands emergency action to help the 57 million children without access to primary education. Pakistani education activist Malala Yousafzai, who earlier this year became the youngest-ever Nobel Peace Prize nominee, addressed the UN on this topic last week. Other actions include watching a video and taking a quiz on preventable and curable diseases, designing a condom wrapper that empowers women, sharing stories of entrepreneurs in South Africa, and more. The Global Poverty Project is pushing for one million actions by September. The Festival has also partnered with Cotton On Foundation, which sells products in a thousand retail stores to fund projects involving health, education, sustainability and infrastructure. Other partners include leading non-profit groups such as the Global Partnership for Education, A World at School Initiative, Women Deliver, World Food Program USA, U.S. Fund for UNICEF, Make Roads Safe, CARE, charity: water, and Malaria No More. 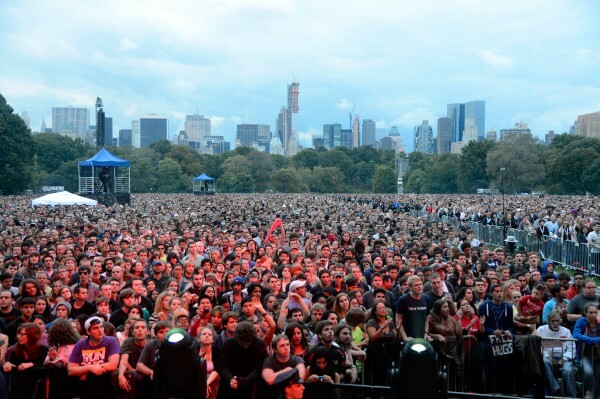 Will you be one of the 54,000 fans to attend The Global Citizen Festival on September 28? Sign up today to begin taking action. Michael Trainer, Global Poverty Project’s U.S. Country Director, shared his top 5 bands of the moment with us! Check them out here.